"Our team has significantly increased transparency and productivity by implementing Hugo across the organization"
Rokt is a global marketing technology company that’s revolutionizing the customer buying experiencing. By creating a deeper connection with consumers and extending the conversation beyond the moment of purchase, Rokt drives unparalleled engagement and loyalty. But with more than 150 employees spread across three continents, Rokt was struggling to keep its organization aligned. Important customer insights were being buried inside disparate information silos, creating a chasm between the company’s internal and customer-facing teams. Rokt needed a better way to keep its team members connected to each other, the company’s vision, and most importantly, its customers. Enter Hugo. By employing Hugo’s collaborative meeting solution, Rokt can now streamline knowledge-sharing. 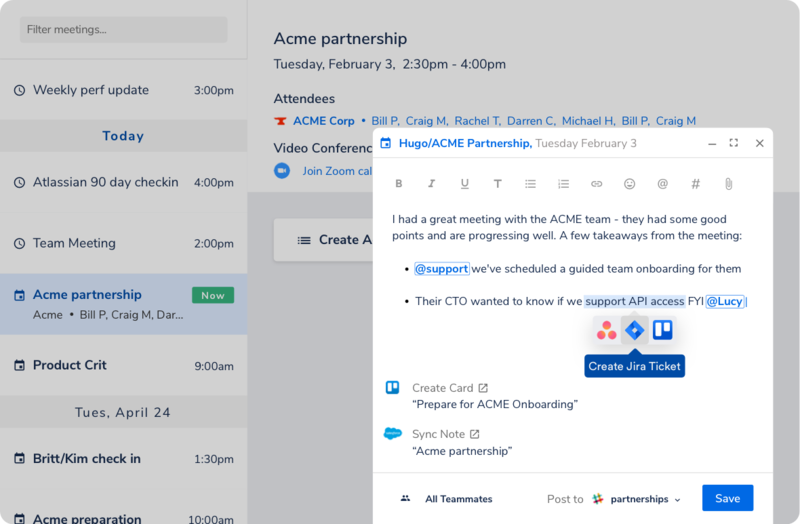 Rokt team members simply connect Hugo to their calendar, and with easy integration into Rokt’s apps like Hubspot, Jira and Slack and customizable note-taking templates, Rokt team members can now share and action customer insights seamlessly. And with automated prompts to collect the right information at the right time and the ability to tag stakeholders, Rokt’s teams never miss a beat anymore. Hugo allows Rokt to derive maximum value from meeting insights by presenting a more holistic perspective of its customers’ needs and keeping all of its team on the same page. The company initially started out with six licenses but expanded Hugo’s platform across the entire organization within days. By the end of the second week, more than 85 percent of Rokt’s team had onboarded. Increased Productivity: Task tracking lets Rokt eliminate duplicate communication threads and redundant work. Transparency: Whether it’s action items, customer needs, or overall business goals, the entire organization is aware and aligned. Simplicity: Say goodbye to information silos! A single source of information means less attendees per meeting and more effective action. Ready to remove unnecessary hassle and make your team (and customers) happy? Hugo is here to help. Designed for fast-growing, customer-centric companies, Hugo fundamentally changes the way that work is done — for the better.